Vulture from spider man set ! Thread: Vulture from spider man set ! so this is new and interesting , I played in two drafts this last weekend , Spider-Man both. And I had 2 sidekicks in the field and my opponent on his turn fielded vulture which took out both sidekicks , and subsequently buffed vulture to a 10 attack , 4+ per die that was knocked out. And then he used silver sable to go unblocked . This was a really good combo ! He also played another person in the draft and managed to give him 46 damage in one turn using this effect . Has anyone else used this effect ? Heard anything else about this. Supposedly wiz kids hasn't made a rules decision about this vulture card yet ! "When Vulture blocks, deal 1 damage to each attacking character die"
When Vulture is fielded doesnt damage your sidekicks, because opponent is the active player. Yea, his buff from blocking doesn't carry over to his turn. My question is if vulture blocks and the attacking team has sidekicks attacking do the side kicks take the one damage and get knocked out before dealing damage to the blocking opponent ? Also does the side kick need to be block if it is dealt that damage would it go to the used pile for dealing damage or prep area ? Thanks in advance ! They would take the damage as soon as Vulture is assigned to block. Unless they had defense buffs, they would immediately be KO'd and go to Prep. Thank you for an answer. This will end countless arguments with my friend ! now, we have to list all the mechanism that leaves a dice from the field to play correctly Vulture. KO by abilities, KO by combat damage, reroll by Globals like Parallax (go to Reserve if energy and pay cost to refield again), sacrifice, capturing/controlling/copying (move dice to....). For example: Using Global´s Iceman? Last edited by bartok; 11-28-2015 at 09:06 AM. Iceman spins dice to energy faces, the die aren't removed from the field while SKs so they wouldn't trigger. Last edited by Scum; 11-27-2015 at 03:25 PM. As @Scum mentioned, effects that roll or spin sidekicks to energy faces such as the Storm, Parallax's, or Iceman's global will not trigger Vulture. This is because effects that reroll or change the face of dice leave the dice where they are. If the die is then in an illegal position, it is moved to a legal position (i.e. move energy in the field to the reserve pool). When sidekick dice change face from a character face to energy, they cease to be character dice, then they leave the field. Since they are not character dice when they leave the field, they do not trigger Vulture since he only triggers when character dice leave the field. I disagree about Storm. Storm specifically mentions moving the die as part of her ability. This ability is moving the die from the field zone, not the default rule of thumb of Dice Masters. Similarly, Umber Hulk and Dwarf Cleric and Enormous Destruction would all follow this "removes a character" trigger because at the beginning of the ability a character was active, after the ability a character was removed. Meanwhile, Shield Agents, Parallax global and Black Cat all reroll dice leaving them in the zone they belong. At the beginning of the ability there is a character, then after, there is an energy, but it's still in the field. THEN the die is moved to the reserve as an energy. Another common thread amongst these abilities is the fact that they move the characters to the Prep Area or Used Pile and not the Reserve. The importance of this is that when a die is moved to these locations their facing doesn't matter, thus meaning that we need to check the status of the die BEFORE the ability, and track it. I agree though that Some rerolls wouldn't count though. The problem is that the moving of dice in the effects of Storm and Co. is conditional upon the face rolled. This means that there is an internal order applied to the effect. First, they are rolled and their new faces solidified. Then they are moved accordingly, with character faces never leaving their place. As such, when the dice are moved, they are already on their energy face and no longer character dice. I understand that you resolve a whole effect before moving on to others, but in this case the first part of the effect rolls the dice and then they are moved. It doesn't matter what face they were on when the effect began, it matters what face they were on when they leave the field as only character dice will trigger Vulture and when sidekick dice are rolled to energy faces and moved to another zone, they are no longer character dice and do not trigger Vulture. The Maria Hill Ruling seems to disagree with you though. The ruling says that Maria's ability triggers in response to Storms effect, meaning that Maria Must be active and count as a character when leaving in response to that effect. Secondly, the Loki ruling shows us that though there is an ordering to the execution of abilities, until an ability has fully resolved, triggers must wait. Triggers such as moving energy to the reserve pool or even possibly changing the known state of a die. In my opinion Rolling a die is a game mechanic used to randomize something, no different than rolling a d6 to resolve and effect and applying the sides of the D6 to the relevant faces to determining the result. Until the ability that resolves the roll is complete, the die is considered active on the face it was at the begining of the ability. Ant-Man and Moondragon prove this to us by having a game mechanic that lets them reroll themselves. If we checked die state in the middle of their abilities we would never be able to return them to their original faces, because they would lose their active status mid ability. To reiterate, abilities that specifically mention rerolling a die, then having the die leave play as a result of the roll, would count as a CHARACTER (or action die) leaving play, not as energy leaving play, because the character can't change state from character to energy until after their ability resolves. So, sadly, this seems to make sense. But I think the Iceman Vulture combo is not healthy for the game. I have finished games on my third turn by buying only Vulture and using Iceman to pump him up to 20+ and not had to make any interesting decisions to do that. Anything that ends the game before an opponent has even put the dice they bought into their bag seems like it isn't good for the game, especially if it's a strategy so simple that even I can pull it off. In cases like these, should we not actively want the least powerful option? Like Wonder Lock, they just make the game more boring. Sorry, also, hello! I do not post much, but I do read a lot and love the podcast. In cases like these, should we not actively want the least powerful option? No. We should strive for the most sensible option. If its weaker or not doesn't matter, as long as it makes more sense than the other options. In a case where two options make an equal amount of sense the game should have a clear and concise manner for processing game texts as to remove doubt from the other side. The Maria ruling being applicable seems to make sense in some situations. I think I can agree with @Shadowmeld even though I think it means reroll effects are sloppily handled by the game. 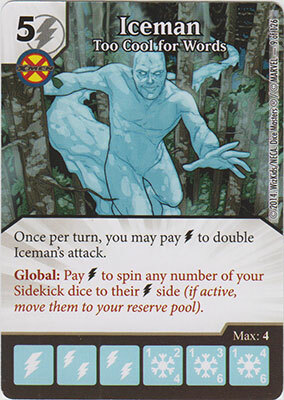 However, I don't think it applies to Iceman since Iceman spins dice, then the dice leave because of their faces. I agree, Iceman uses reminder text to REMIND us that after the ability resoles they will be moved to the Reserve. Moving them is not an aspect of the ability. As such, very FEW reroll effects would count as a character leaving the field. Storm and Umber Hulk being the biggest culprits. All other reroll effects don't have a character leaving the field, they have a character becoming energy then energy leaving the field. Now an argument can be made that by becoming energy the character has left, but that argument is akward because the die itself never leaves play, until it becomes Energy. Another argument can be made that it's a character DIE on an energy face that is leaving play, but then one would have to counter that with Sidekick dice aren't character dice when they leave play, so at the VERY LEAST sidekick dice rerolls don't trigger Vulture. In fact you could find grounds for arguing that sidekicks period don't trigger Vulture, but that is a scary precedent to set because any card that says Character Die now can't affect Sidekicks. The simplest, and most inline with current understandings (as far as I can read it) has Vulture only getting a buff if dice leave play and as character faces, or as the result of an ability that targeted them on a character face. I think that if a character is in the field zone, and later it isn't, it left the field zone, no matter why it isn't in it. I agree, Iceman uses reminder text to REMIND us that after the ability resoles they will be moved to the Reserve. I don't disagree with anything you've said, but I think that the likelihood of the reminder text being to reinforce a subtle interpretation of a rule rather than it just being a new concept, like Underdog needing explanation (on only some cards?!) is low. I doubt they foresaw this situation when they wrote it. Also! I would very much take a Reserve Pool ruling as gospel until Wizkids says otherwise, so that last sentence is what our office will play to. Your wording implies that even a character die (not sidekick) being rerolled to energy side and then leaving the field doesn't count as a character leaving the field. Is that right? Yes, with the exception fo Storm, mber Hulk and any other abilities that directly tell you where to send a die after rerolling them, Rerolls don't count as dice leaving play. Why would they not count, given the above rulings? I don't think I understand that. The argument is that when a die is rerolled, it is still a character until the reroll action is completed. Once that occurs, it is either Energy or a character. If it's Energy, THEN it's moved to reserve. At which point, you have an Energy Die moving from play, not a character. With Storm, you have a character, who is rolled, and based on the roll, he is either moved from play or returned to the field. He is still a character though because it's still in the midst of the ability that rolled it. The die itself is never given the chance to "become an energy die" because it is always in the middle of an ability's resolution. A better example would perhaps be the Rare Black Canary that send a die to the Prep area when they reroll to energy faces. Unlike say, Rare Black Cat who rerolls a single target and what ever face they land on they are stuck with, Canary is specifically using the reroll mechanic to create a "chancy KO" ability, where Black Cat is using the mechanic to completely randomize the opponent's die, with a chance to send them to the reserve. One ability entirely removes the die from play, or doesn't, the other ability doesn't remove the die from play, but it has a chance to change a die's state to energy instead of character. This is making sense now. Like out of play,you can consider the die to be "in transition"
Correct, the act of rolling the die is just a more complicated method of "flip a coin", and the result is either stay in field or be removed from play. Meanwhile, Black Cats ability is more, flip coin, either stay a character or become energy. It's a subtle difference, but one is a remove from play ability and the other is a type change that results in a bookkeeping step of moving to Reserve. Short question, does Capturing triggers Vulture? I don't think so, because the captured die doesnt leave the field , he just goes over to another field under another die for one turn.